I pity the poor residents along Gloucester Road. They have to put up with bad parking like this. 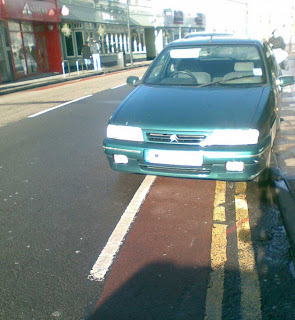 On double yellow lines, blocking a cycle lane and the driver can’t be bothered to get it parallel with the kerb (rear wheel on pavement). The thing is, I photographed this on a Sunday morning with hardly any cars about and bags of legitimate parking spaces. I guess it’s just being lazy. There are, of course, petrolheads who would say 'cycle around it'. Okay then, would, say, 20 other cyclists and pedestrians who read this blog care to join me in standing in the middle of Gloucester Road?. Drivers can just go around us, can't they. A similar example of driver laziness that I've witnessed a lot of lately is using bus lanes as short cuts. For a hobby, I stand in them (moving for buses), or cross very, very slowly, stopping and looking perplexed if a car approaches and appears to be waiting for me.